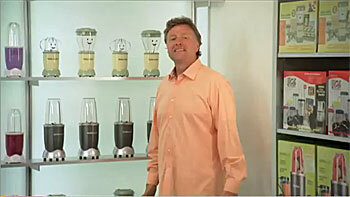 I wonder if there really is a “Bullet Headquarters” in Hollywood where the walls are lined with various incarnations of the Magic Bullet product line…or if they just set up that background for the video. The prize of $10,000 and a trip to Hollywood are fine, but what is really intriguing is Mick’s comment (almost in passing) that the “top three finalists” will get to “star in their own Magic Bullet infomercial.” Does this mean three lucky people will get to appear on the next Magic Bullet broadcast TV infomercial in the kitchen with Mick and Mimi, whipping up their very own recipes for the likes of Hazel and Berman? Actually, no. According to the contest Facebook page this is only a two-minue “online infomercial,” which is really pretty lame. To enter the contest, you have to go to the contest Facebook page at www.KitchenMagician.com (they force you to “Like” the page to proceed) and then upload a video of yourself using the Magic Bullet. Facebook users then get to vote on their favorite videos (though it appears that the votes only “help” the contest promoters narrow down the finalists). The three finalists fly to Hollywood to shoot an online video and the winner is crowned “Kitchen Magician” and receives $10,000. * Hazel’s prop cigarette from the Magic Bullet infomercial (signed by Hazel, of course). *Granny’s false teeth from the Bullet Express infomercial (signed by Granny, of course). * Mick’s “Hasty Delivery” uniform from the Baby Bullet infomercial (signed by Mick, of course). * Mick’s “nice package” from the Baby Bullet infomercial (signed by Grandma, of course). * A 7-course meal prepared in front of you by Mick Hastie and Mimi Umidon using the Magic Bullet and Bullet Express. * Acting lessons from “Lindsay” of the Baby Bullet. * The actual tent where Berman and Hazel did the deed in the woods. * An hour-long session of Aunt Martha and Granny nagging and nitpicking everything you do. 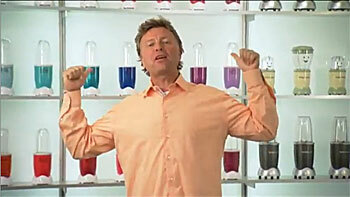 I’m sure you Magic Bullet fans can come up with a lot more! 10,000 thanks to reader Jonathan C. for letting us know about the Kitchen Magician contest. I would’ve loved to have participated in this. The video isn’t working anymore? Does anybody know where I can find a copy of it? I absolutely love Baby Bullet. I used to have one myself. I miss the days making home made baby food with my Bullet!